Mother's Day is coming up, and you know what that means - breakfast in bed, massages, no dishes to clean, and an afternoon of sewing all to myself without someone whining for a snack! At least, that's what I want for Mother's Day. That and a cover stitch machine. A girl can dream, right? This month's Michael's Makers post is all about celebrations, and I chose to celebrate Mothers. Mother's Day is a wonderful time to give special recognition to the women in our lives with love and appreciation for all that they do, and traditionally that involves giving Mother's Day cards, so I wanted to come up with a card that is more than it seems. I'm actually not at all a card person at all. I never buy them. I appreciate the gesture, but I personally don't like to buy something that I know will get thrown away almost immediately. 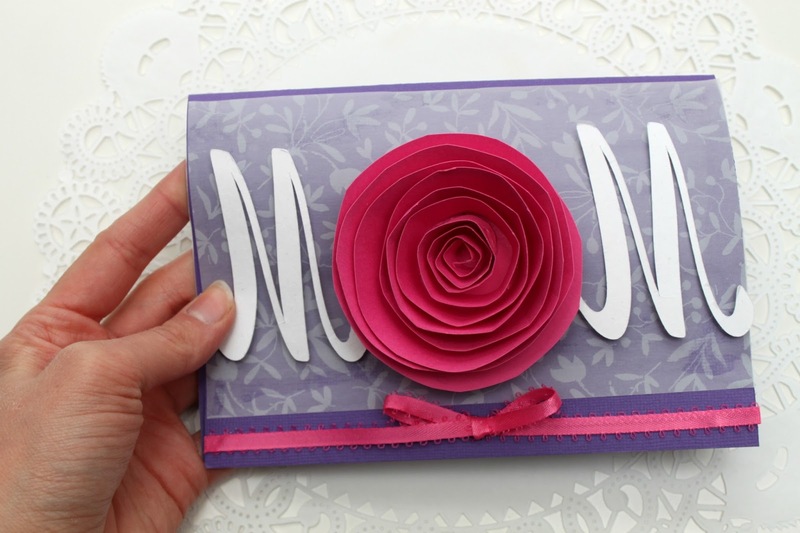 This card is different though - it has a detachable brooch that Mom can wear! I love that I am able to give a card that says all the wonderful things I want to say to my Mom, but has the bonus of something she can wear to show my love too. 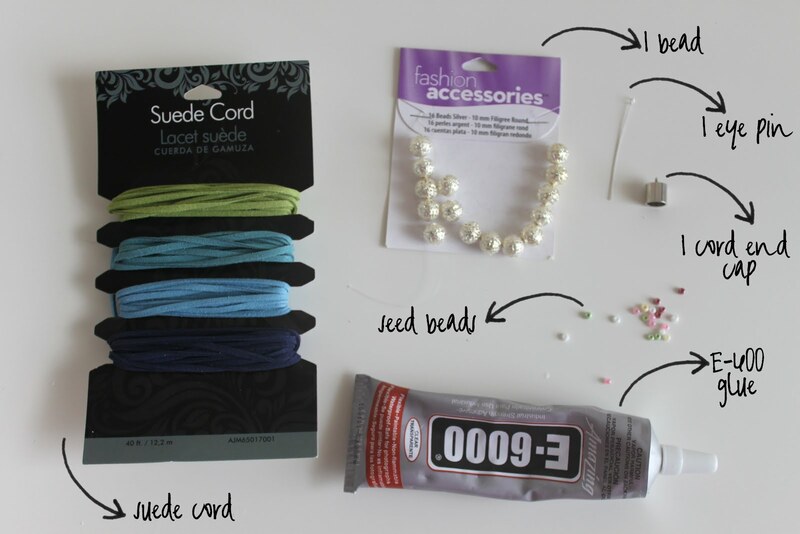 SUPPLIES: cardstock in 2 colors (one for the card and one for the rose), vellum paper, jewelry pin, foam adhesive craft circles, paper trimmer, scissors, hot glue, craft glue. 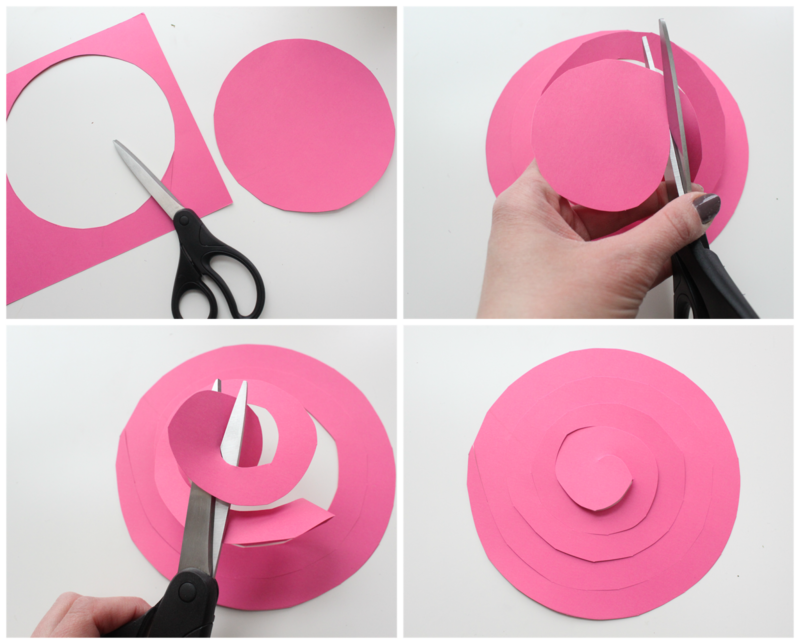 ONE: first, use a bowl or something else circular to trace and cut out a circle from your pink card stock. TWO: you can draw a swirl on your circle or just freehand it like I did. Start on the outer edge and cut a swirl until you reach the middle. FOUR: here's what your rose should look like so far! FIVE: starting at the outside edge, begin to tightly roll your rose. SEVEN: when you reach the center of your rose, it should look like this. 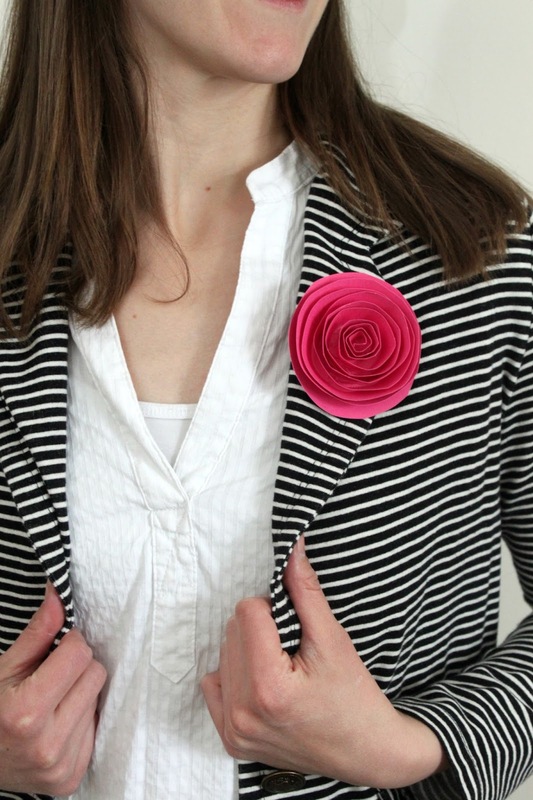 EIGHT: poke your pin through the center of your rose as shown. NINE: cut a small circle from your card stock and apply it over the base of your pin. Secure with hot glue over the flat part of your pin. TEN: allow your rose to uncoil slightly. Put a generous amount of hot glue at the center of your rose to secure in place. ONE: cut a piece of vellum to size. I made mine as long as my card, but left a couple of inches at the top and bottom. TWO: secure the vellum to your card using crafting glue (don't go crazy with the glue or you will get lots of wrinkles! Trust me on that one ;) Allow your card to dry. THREE: poke a hole through the top layer of your card using another pin (or something similar) where your rose will go. FOUR: insert your rose through your card and secure on the inside with the back of your pin. FIVE: cut out your M's (I used my Silhouette Cameo for this, but you can buy or cut your letters by hand.) Place your foam adhesive dots on the back of your letter. SIX: peel off the backing and attach your M's on either side of your rose. SEVEN: finally, I tied a piece of ribbon in a bow and hot glued it to the front to complete the card. ...and on top of your sweet words in your handmade card, Mom will have a detachable brooch that she can wear with pride on Mother's Day! That's my kind of card. I hope you enjoy! 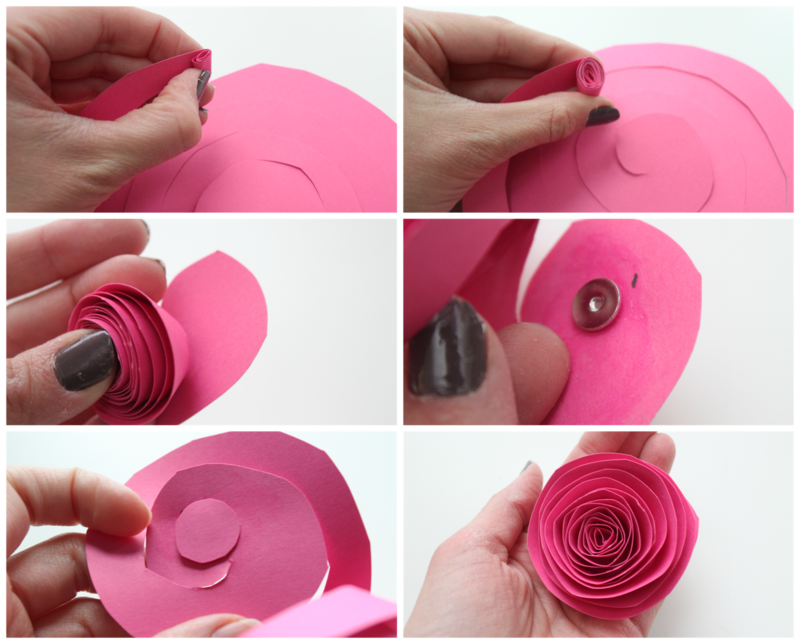 The rose is so easy to make, you could even get the kids into it and make a card for Grandma. Happy Mother's Day! I love the look of leather tassel necklaces like this one at Anthropologie, but I don't love the price tag. I had a bunch of suede leftover from my knotted suede bracelet project, so I decided to whip up a tassel necklace with some of the leftover. 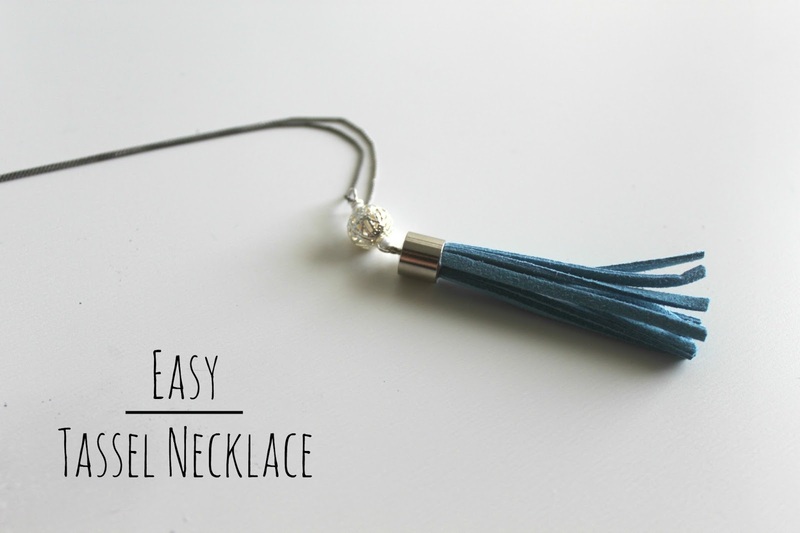 These are easier than most leather necklaces I've seen (since you're basically just stuffing a bunch of suede in a cap end) so you have no excuse not to make one. And, if you're looking for a gift for Mom on Mother's Day, this would be perfect! SUPPLIES: I found most of my supplies at Wal-Mart and Hobby Lobby, but Etsy is also a great resource for craft supplies. You will also need chain, a small jump ring, scissors, wire cutters and round nose pliers for this project. ONE: cut 5 strands of suede cord (or more depending on the size of end cap you have) 5 inches long and bunch together as shown in the picture above. TWO: fill your end cap with E-600 glue and insert the folded parts of your cording into the cap securely. Let dry according to the instructions on the tube. THREE: insert 1 seed bead on your eye pin, then add a decorative bead followed by a second seed bead. FOUR: Loop the end of your eye pin over the nose of your pliers close to your seed bead, then wrap the wire around a couple of times and snip off any extra. (Not shown) open the other side of your eyepin some and thread on your end cap. Use a jump ring to attach the other end to your chain. And that's it. Classy, and SO easy to make. I just love mine and can't wait to make more in different colors.